As a Catholic school, we are priviliged to be able to incorporate faith into our daily instruction. While we do teach the Catholic faith in particiular, we are respectful of the fact that one-third of our students are not Catholic. All students participate in all Religious activities and instruction, but we do not distinguish Catholic or non-Catholic among the students. We are all Christians, and the more we learn about our faith and our God, the more we realize that we are all God’s special children. All students in Kindergarten through grade eight attend Mass on a weekly basis. This is usually on Friday; however, the day may change on occasion so that the children can attend Mass for a holy day or special occasion. A Mass schedule is sent home at the beginning of the year. Parents, family members and friends are encouraged to attend all of our school Masses and prayer services throughout the year. 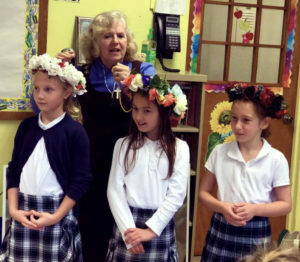 Classes take turns in participating in the ministries at our school Masses by serving as lectors, gift bearers, altar servers and choir members. Parents are notified by the classroom teacher when their child’s class will be leading the Mass.